This EP LP record was compiled and released for Record Store Day 2017 (April 22). 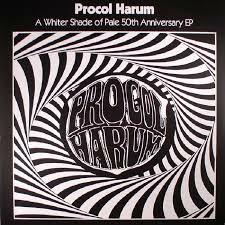 It was, among many others, a featured release, and was no doubt intended to be in conjunction with the fiftieth anniversary of the release of A Whiter Shade of Pale – which, of course, is what ‘started it all’. It should be mentioned right away that, although this is modestly billed as an ‘EP’ – it has four tracks on each side: the ‘Mono Side’ is about 17:06, and the ‘Stereo Side’ is roughly 18:16. There were many ‘real’ LPs released over the years that were shorter than that. Possibly the ‘theme’ and repeats make it an EP, but its length is that of many LPs. So, in the spirit of Record Store Day, I tracked down (finally! – I’m not an ‘early adopter’!) a copy at a little, overstuffed record store on Princess Street in Kingston, Ontario, Canada called Brian’s Record Option. Brian and his store have been there for years. He’s always been the sole ‘employee’, mainly because, as he said some time ago in an interview, there wouldn’t be room for anyone else. No kidding! It’s one of those little hole-in-the-wall places where you constantly have an eye on the piles of records (music, magazines, sheet music) lest one of them comes tumbling down – maybe on you! Customers optional. Enter at your own risk! Despite that, he knows where everything is, it seems, and when I walked in, he greeted me from behind his desk on which were stacked several LPs. I asked him, “You look like you might be old enough to remember Procol Harum. Might you have any of their re-releases on vinyl?” He jumped up – “Oh, I just might…” – and went deeper into the store (I dared not follow him – I could still see him and he appeared safe! ), reached under a record bin and came up with this brand-new album. When I saw it, I was totally surprised, nay delighted. I said “Sold!” without even asking the price. I was surprised he had that one in stock, and I told him so. Turns out that, for Record Store Day, he had ordered multiple copies of this and a few other titles that he was “familiar with” rather than one or two copies of nearly every RSD release. He said that, frankly, his gamble had paid off – as he put it, “I can more easily sell stuff I know than stuff I don’t” – and about this particular one – “this is most often the only Procol song anyone has ever heard of” (sound familiar? ), so he figured it would sell. Also turns out that I got his last copy, and he said that, as far as he knew, it was the last one (in a record store) in the country. And so it was that later … I stayed for a few minutes to chat with Brian, who’s a really interesting guy. A young lady came in to ask if he had any ’60s music (imagine!) – he said he did, so she asked for suggestions as she wanted to surprise her father (or was it grandfather?) for his birthday. Sure enough, one of us (me, I think) suggested Procol Harum and she looked back blankly – she hadn’t heard of Procol Harum nor of AWSoP – so we moved on, and Brian found her a Beach Boys record (I think). Brian and I chatted a bit more; I reluctantly moved on. Later that day I Googled the shop, and found out that his father was a record distributor in Montréal (which is about three hours from Kingston), and that I’d known him when he was a supplier to the record store where I had worked between 1969 and 1972 (or 1973) – small world! If you want a really good impression of Brian (“the owner, proprietor and sole employee”) and his store, check this article (I don’t think he has an official website). It’s an interesting story. Okay, enough about me (and Brian, and his store): on to the record! It has eight songs – four each on the ‘mono side’ and the ‘stereo side’ (only three listed for the mono side – more about that later). 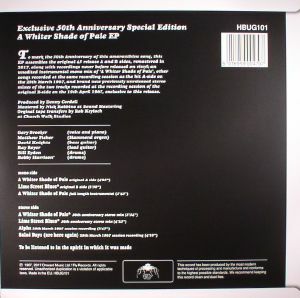 A Whiter Shade of Pale appears in three versions: two in mono – the original hit single and the previously-released (Westside 30th Anniversary CD box) instrumental version – both with Bill Eyden on drums from that initial recording session (29 March, 1967) at Olympic Studios. On the ‘stereo side’ there’s a stereo version of AWSoP recorded with Bobby Harrison at Advision Sound Studios (19 April) – and it’s NOT the same stereo alternate take of AWSoP – the more familiar bonus track which appears on several recent CDs. Lime Street Blues, which was also recorded the same day at Advision, appears twice: the familiar mono B-Side to the hit, and a longer, previously unreleased stereo version, both with Bobby Harrison, and recorded the same day (I must say I prefer the ‘new’ longer version, not just because it’s in stereo, which is quite acceptable, but because, as a blues song, it needs more interesting riffing, and gets it.) I can’t tell if the stereo version is simply a longer version of the mono recording or a separate take. Incidentally, all guitar parts on the entire record are from original (and largely underappreciated) guitarist Ray Royer, who acquits himself very well on Lime Street, and (probably) on the untitled tune mentioned below. Note: there’s no BJ Wilson here, as he and Robin Trower were to join only later in 1967. Other tracks: previously-released tracks that were on the two recent CDs (Salvo and Esoteric) and as good (or not so) as has been discussed by many others. But the real ‘find’ is an undocumented and unnamed (fourth) cut on the ‘mono side,’ which I (for one) have never heard before – an all-instrumental twelve-bar-type Memphis blues jam that goes for about 4:25; it’s reminiscent of a Booker T and the MGs' tune, and certainly done in that style. There is some great soloing from Brooker on piano and Fisher (an unabashed admirer of Booker T Jones) on Hammond, but there’s a nice surprise in some very nice guitar work, probably (!) from young Mr Royer. Obviously, had he been there (? ), Trower would have killed it, but Royer acquits himself very well indeed. We have too few examples of his guitar work with Procol, and it’s probably better than some would like to admit. (RT can make us forget just about every guitarist, except maybe his successors) The track remains unidentified, and is further obscured by lack of information on where and when it was recorded and who played on it. A true Easter egg, then – this compilation was released on 22 April 2017 – just a week after Easteron April 16, and …. according to the insert, the ‘package concept & project vivification [was by] The Fly Easter Egg Corp Inc.’ Clever, innit? The album package includes a single 12 x 12 cardboard insert: one side gives track details (except, of course, anything about the mystery track! ), and, of course, an ad for the MoV releases of the First Four. The other side of the insert has a densely printed, twelve-paragraph essay / potted history of the early Procol Harum and the composition, realisation (including assembling a band) and recording of The Song and its historical context. It mentions the other songs recorded at that initial session on 29 March 1967, as well as the later ‘Harrison’ sessions at Advision. This record is, then, a really nicely-done commemorative of the most-played track of the Twentieth century (at least in Britain) from that perhaps most iconic of years (at least in rock culture). The pressing is excellent – ‘Made in the EU’ (whatever that means these days). Fly Records have issued this as a limited edition (I’ve heard 500 copies?) Record Store Day special, and one can only hope that more will be issued. I can’t imagine there not being some continued demand for it, since neither AWSoP nor Lime Street appears on the Music on Vinyl release of the self-titled album (I’m sure there was much debate in pre-production meetings on that issue – I suppose ‘authenticity’ ruled the day). For now, get one if you can find one. © Peter Bourne 2017 ... thanks!